Following our previous article on Companies and Corporate Governance, we set out in this article some emphasis on matters important to board of directors. 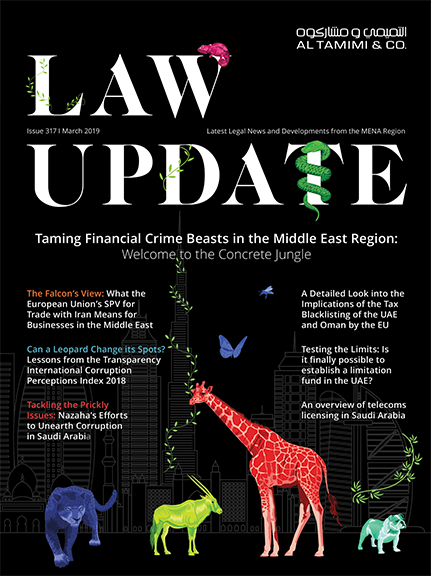 In our September issue, we published “Companies and Corporate Governance – Overview”, in which we overviewed the corporate governance as a framework in the United Arab Emirates, discussed its mandatory application to public joint stock companies and touched briefly on its legal framework and components. Set out below is an analysis on the practical application of the corporate governance rules in the UAE public joint stock companies. The board of directors is the competent body for managing a public joint stock company and, is accountable to shareholders and regulators for the performance of the company and for breaches of the applicable laws, regulations and/or internal regulations. The corporate governance principles mandated pursuant to the ministerial decree no. 518 of 2009 (“Decree”) set out restrictions, rules and guidelines designed to ensure best managerial practices, to avoid conflicts of interest and to protect shareholders’ and stakeholders’ interests in the company. According to Article 95 of law no. 8 of 1984 concerning the Commercial Companies Law (“Companies Law”), the board is constituted of a number of members not less than three and not more than fifteen as determined by the articles of association of the company . In addition, the Decree further provides that the majority of the board members must be non-executive members and, at least one third of the board members must be independent. What are “independent” and “non-executive” directors? To answer this question, we have to first; categorize board membership into two main categories according to the nature of the appointee. Generally speaking, a board member could be either; (i) a natural person, or (ii) a corporate entity. By law, a corporate entity could be appointed as a board member provided that it is represented on the board by a natural person who is the representative of the entity. The board membership criteria stipulated under the Decree will therefore be addressed according to these categories. Executive members are members responsible for the daily management of the company and, are the delegates of the board to take certain decisions determined in their assignment. They must be full time members and fully dedicated for the assigned managerial duty and may be granted a fixed salary for managerial tasks apart from the annual remuneration of the board. Any board member who is granted a fixed salary aside from the annual board remuneration determined by the general assembly will be considered an executive member. Other expenses, allowances and salaries granted to the board member as a result of a board member being appointed as a member of the board’s committees will not be considered as a fixed remuneration that would fall into executive members’ remuneration. As stipulated under the Decree, the majority of the board members must be non-executive members, who have adequate experience to protect the interests of the company and, to bring a diversified vision to the board and the process of decision making. The non-executive board member should be able to devote the time necessary for undertaking duties and responsibilities of their membership, and membership of the board does not constitute a conflict of interest with any other positions they hold. Under the Decree, the roles of the chairman and the managing director should not be exercised by the same individual to avoid the potential conflict of interest between the duties of the chairman, being a non-executive member and the managing director or the manager of the company as a part of the executive team of the company. It is worth a noting that the Decree did not address the position of the vice chairman, who replaces the chairman upon his absence, and whether the vice chairman should be elected from the executive or the non-executive members. However, applying the merits of the Decree, we would argue and recommend that the role of vice chairman must be elected from the non-executive members to maintain the same criteria applicable on the chairman being his replacement. As mentioned earlier, the board is constituted of at least one third of independent members. The independency criterion is related to the nature of the relationship between the board member, the company and its related parties. A board member will not be considered independent if, the member himself, his spouse or any first degree relatives have served as a member of the executive management of the company during the last two years, or has had any a relationship that resulted in financial dealings with the company, its parent company, sister company, or allied company, within the previous two years, in an amount exceeding 5% of the paid up capital of the company, or the amount AED 5 million whichever is lesser. Are directly related to not-for-profit organization that receives a material financing or aid from the company. Own by themselves or by any of their children a share in the company’s capital that exceeds 10% of the capital of the company. What Happen if Independent Board Members Cease to be Independent? If, any independent board members lose their independence, they are required to notify the company of the event giving rise to the loss of independence immediately. The matter should be referred to the board of directors by a permanent committee of the board named the Nomination and Remuneration Committee, which in return notifies the relevant director to clarify the incident that resulted in the loss of independence. The director must reply to the board of directors within 15 days from the date of notification. The board shall decide whether the director in question is independent or not in its next meeting after the director’s response, or immediately upon the lapse of the 15 days period if, no response is received from such director. If loss of independent status of that director does not cause the number of independent members to fall below the mandatory minimum, the director could maintain their board membership. However, if loss of independent status reduces the board’s number of independent members below the minimum level, the board must appoint a replacement member. The appointment should be referred to the next general assembly meeting for replacement. The Decree is silent in relation to membership of corporate entities in the board of directors and, thus, makes no distinction between the provisions applicable on natural persons. Therefore, the same principles apply to corporate entities, which are directors, with respect to the executive and non-executive criterions.